Our departure from Capon Springs Resort was lovely – it was a golden, perfect morning. The first part of our drive as glorious and green and twisting as one could hope for, with purple and orange wildflowers edging the roadside. The spell cast by our three intensely rural West Virginia days lasted until we pulled onto the Pennsylvania Turnpike. I’ve driven the length of this road many times in the past three decades. But it had been a while since I was on the western leg and I had forgotten about the narrow lanes, sharp curves, tunnels and above all, the numerous semi trucks flying along with little regard for the smaller vehicles in their way (the speed limit for much of this stretch of road is 70 miles an hour). It felt like something of a jarring return to the 21st century, and not for the first or last time on this trip I wished that I didn’t have to do all of the driving, especially since I had three bikes bouncing around on a tenuously attached bike rack at the back of my low-riding Saab station wagon. But at last we emerged from one last tunnel with our destination in view: Pittsburgh. 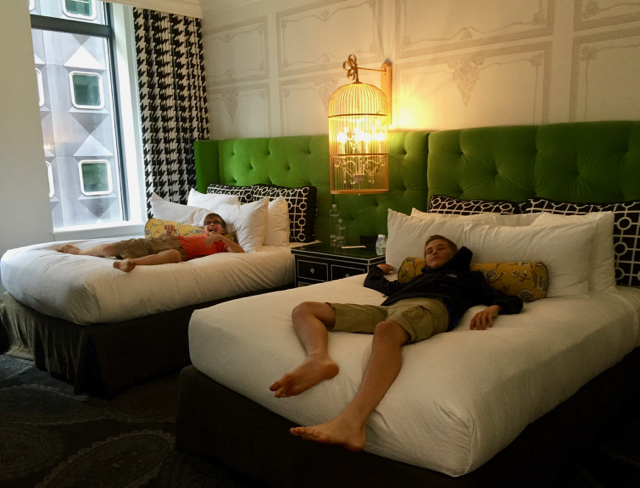 Like all Kimpton Hotels (I’m an unabashed fan girl of this chain, but more on that in a later post) the Hotel Monaco in Pittsburgh is a mix of quirky decor, chic luxury and genuine comfort. Our corner room was spacious and full of fun colors and patterns with numerous bird-and-postage-themed details. They loved this room – can you tell why? Although the boys were immediately inclined to sprawl, I knew that they needed to eat a late lunch, so we dropped our bags and headed straight downstairs for The Commoner. The interior of this restaurant manages to be both cozy and post-industrial with lots of dark wood, subway tile and riveted columns. The lunch portions at The Commoner were huge. The food is a similar mix of comfort and high concept – Tommy’s mac and cheese had a fried egg on top and Teddy’s burger came topped with smoked cheddar cheese. 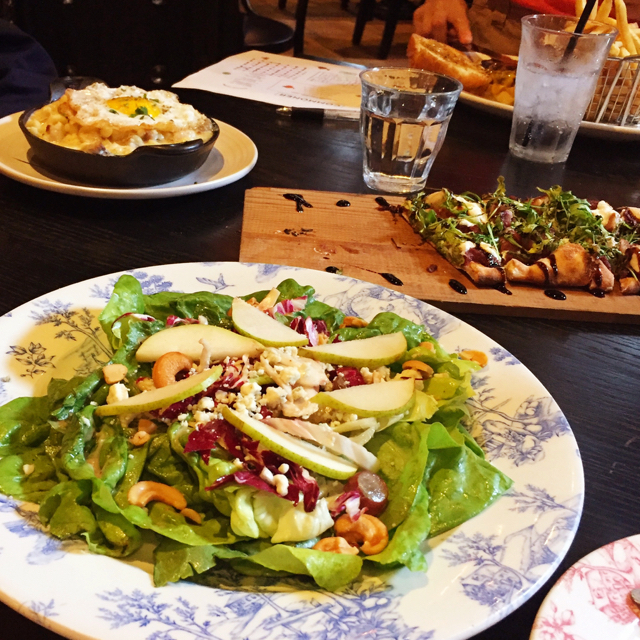 I enjoyed a butter lettuce salad with cashews, grapes and apples and a flatbread topped with prosciutto, greens and a balsamic drizzle. Portions were generous and the service quick and before we knew it all those trucks I had been dodging for the past few hours just faded into the background. We were ready to explore. 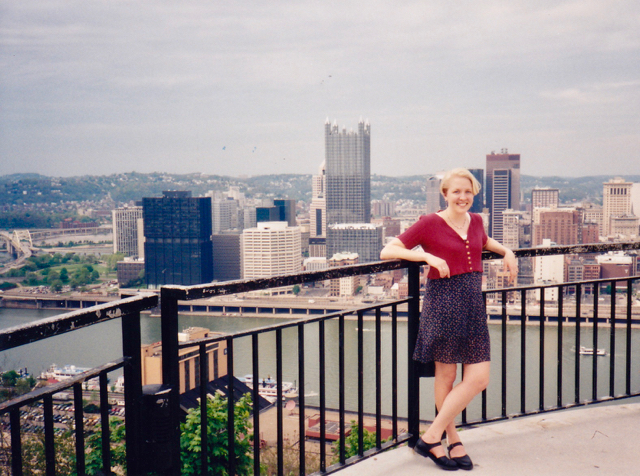 The last time I visited Pittsburgh was sometime in the mid 1990s when my then-boyfriend, now-husband Matt and I were in graduate school at Penn State a few hours away. I remembered it as a place that was a little gritty and a little hip, a place trying to honor the heritage of the coal and steel industry while also putting the 1970s resolutely behind it. But my memories were more glimpses than anything else. We were desperately broke, of course, but couldn’t resist occasional splurge trips to the city for hotel stays and meals out. There was a Mexican restaurant we liked near the University of Pittsburgh campus with bottles of an addictive spicy green sauce on all the tables and an Italian place downtown that made table-side fettuccine Alfredo – but I didn’t know the names of either place or whether they were still in business. I remembered practicing pronouncing the name Monongahela (mah-nahn-gah-heela), the river which meets both the Ohio and the Allegheny at the city’s founding place. I know that on one visit to the city for a writing conference I saw August Wilson read from Seven Guitars, which he hadn’t yet finished at the time. 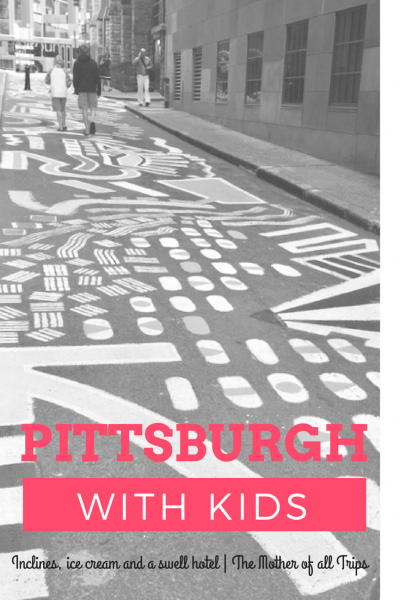 But I don’t remember what I learned about Pittsburgh and its neighborhoods from his reading, just that there were many neighborhoods separated by hills and, in the early 20th century, by the ethnicities of their inhabitants. But I did remember riding a cable car up a shockingly steep incline beside one of the rivers and strolling and taking pictures from the top. And so it was I decided that on our first afternoon the boys and I would get the lay of the land in this same way through a bird’s-eye view of the city and its bridges and skylines. The cool skyscraper to the left is the Alcoa Building. We set out on foot from the hotel’s front door, stumbling across a mix of old and new, of beautification efforts like a sidewalk being painted before our eyes followed by vape and pawn shops a few blocks away. This street was being painted as we walked it. 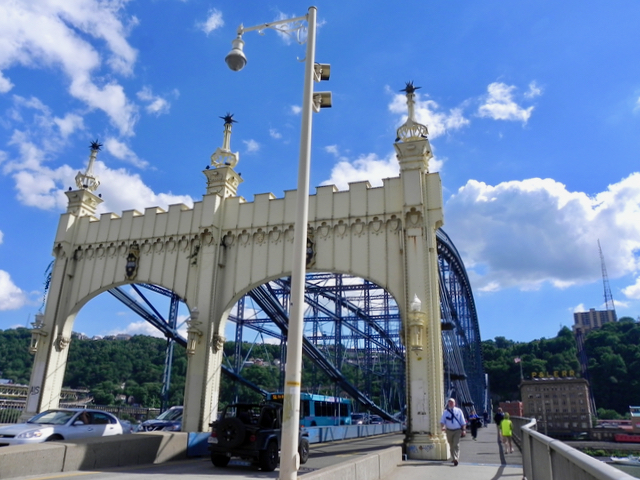 The Smithfield Street Bridge, one of over 400 bridges in the city and one of the oldest steel bridges in the United States, invited us across the Monongahela when we reached it. I love the decorative detail on the Smithfield Street Bridge. 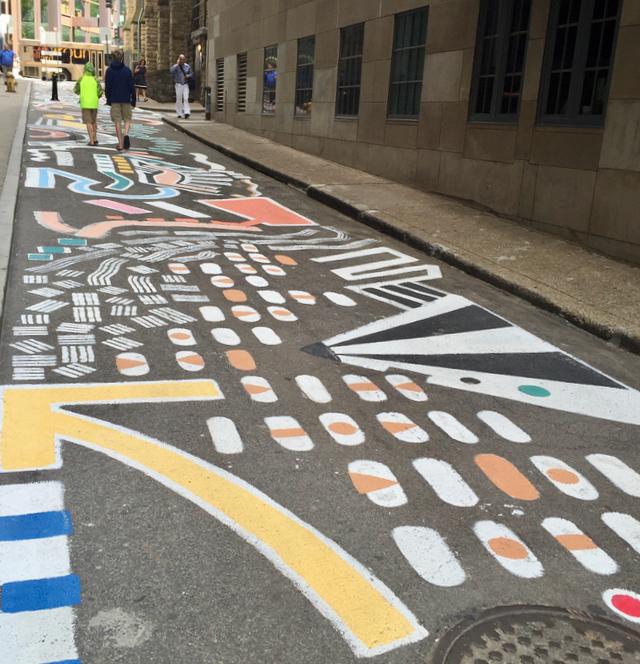 This was one of the things I immediately loved about Pittsburgh, the way its history is underfoot all the time. They made things here once and the city quietly reminds its visitors of that fact at every opportunity. 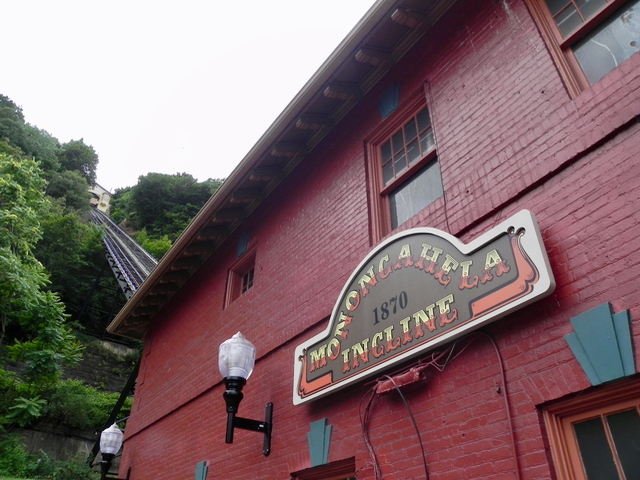 History here is about utility and common sense.The cable cars at the Monongahela Incline have crept up and down the mountain without interruption for almost 150 years, and why would there be any need to change that fact? Teddy thought this would be like an amusement park ride. Not so much. Teddy tried to get alarmed when he saw how steep the ride would be, but that’s only because he didn’t realize quite how slowly the cars move. I teased him all the way up, up, slowly up. The hill that the cable car ascends and the neighborhood at the top are called Mount Washington, named for the fact that young George Washington used this spot as a place to survey and map the lands around the Ohio River for the British. All along the edge of the aptly named Grandview Avenue there are overlooks filled with visitors and locals alike. Brides and grooms pose here and there are yoga classes. It’s one of those great democratic spaces that gives anyone who comes along the keys to the city via its views. 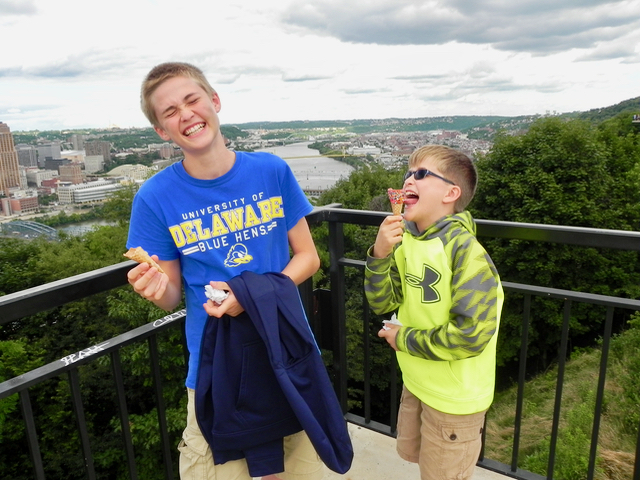 Ice cream helped them pose for some photos from the overlook on Mount Washington. Well, sort of. I would be remiss if I didn’t point out that the boys, upon seeing a sign for DiFiore’s Ice Cream Delite as soon as we came out of the incline station, requested the purchase of said ice cream, a request which I honored despite the size of our lunch because I hoped it would enable a more peaceful stroll. This was successful until both boys said that they needed to use a restroom when their cones had vanished. Happily, the local branch of the Carnegie Library of Pittsburgh came to our rescue. Pittsburgh – and me – in 2017. Beer? Check. Sausages? Check. Lovely sunset? You bet. The Biergarten has it all. Originally I had intended to take the boys out for dinner, but when we got back to the Hotel Monaco all Teddy wanted to do was hang out in our room and watch cartoons. Since the hotel had been kind enough to provide a snack and since we had enjoyed such a big, late lunch (to say nothing of the ice cream) I decided to let him really relax and enjoy himself. Tommy and I both felt like we needed a bit more to eat however, so we headed for the elevator up to the hotel’s rooftop restaurant, the Biergarten. 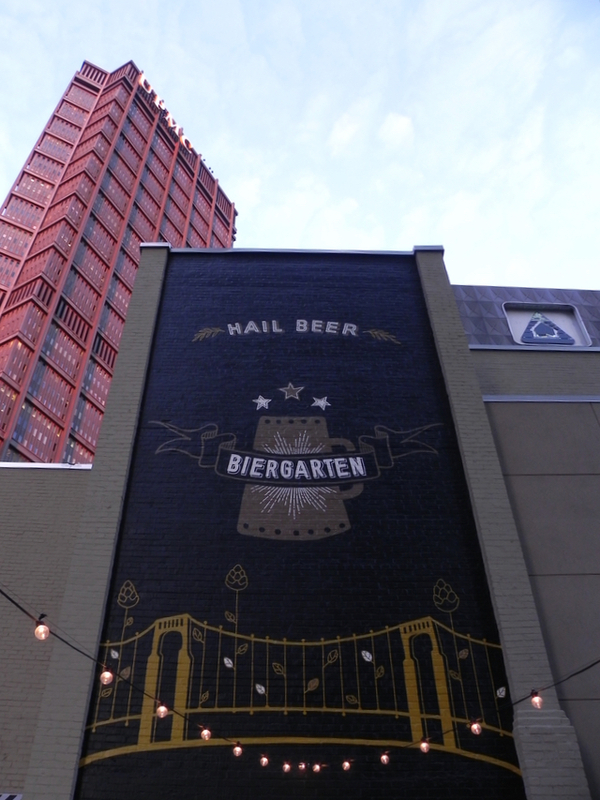 The Biergarten is the Hotel Monaco’s rooftop restaurant in Pittsburgh. 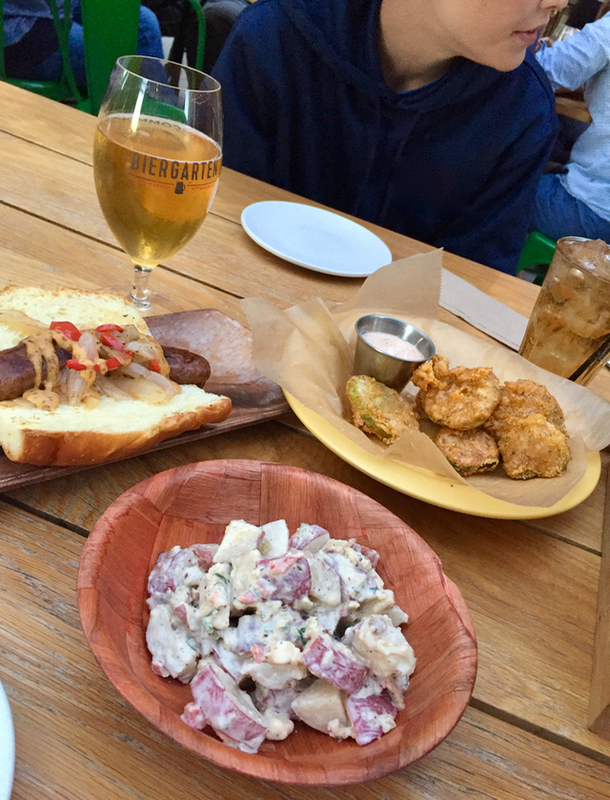 There, in the full pink glow of the setting sun, we enjoyed beer braised bratwurst, fried pickles and German potato salad laden with salty bacon. We were supposed to share this bratwurst. We ended up ordering a second one. Admiring the skyline, since of course we had made it our own that afternoon, we decided that we must figure out what the cool building we could see from our room was. 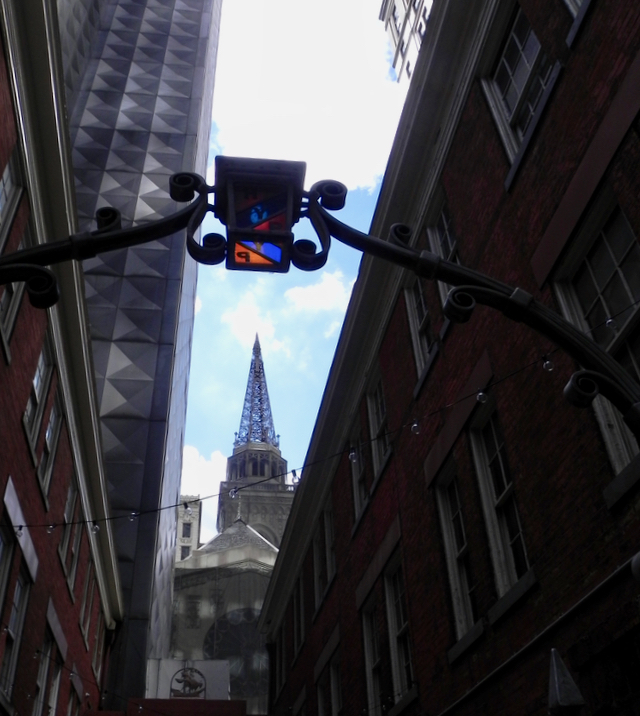 Directly facing the hotel, its facade had shimmering triangles and windows with rounded corners. It looked like a place where George Jetson would work if he had a job in Pittsburgh. Thanks to Wikipedia, we learned that it was the former headquarters for the Aluminum Company of American (ALCOA), was built in 1953 and contained a radiant heating and cooling system that kept it from needing any radiators or air conditioners along the exterior walls – so it was space age. It was the first skyscraper with a completely aluminum facade, which is only 1/8 of an inch thick and is super lightweight. It used to be called the Alcoa Building, and that’s how I refer to it still, since the new name is the decidedly unromantic and ahistoric Regional Enterprise Tower. Thus nourished with plenty of pork and information, we headed back to the room for a night in those delicious beds. I couldn’t wait to see what additional wonders Pittsburgh would show us in the morning. Fun! Perhaps you’ll cover this later, but our favorite place in Pittsburg was the Cathedral of Learning–those nationality rooms were straight out of Hogwarts, such a magical place. 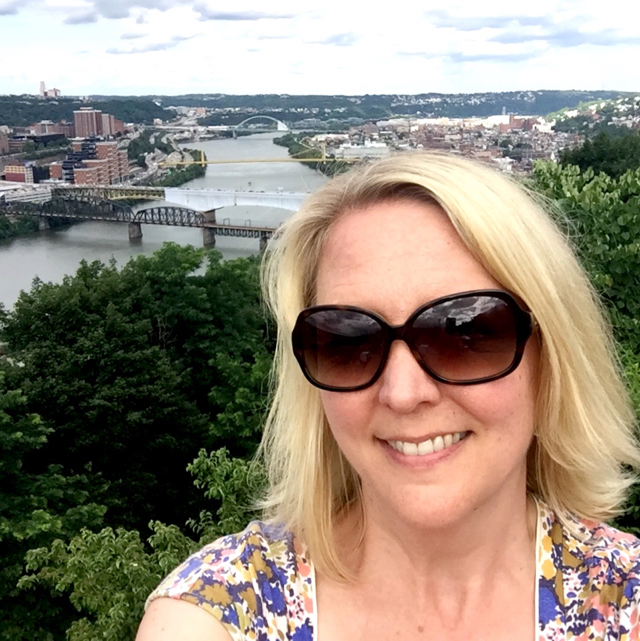 Hi Anita – I love the Cathedral of Learning! But we didn’t actually make it over on this trip, which was a short one. I definitely want to go back to Pittsburgh though and take the kids there. Thanks for stopping by.